By CNN'S DUARTE MENDONCA CONTRIBUTED TO THIS REPORT. Thousands of anti-Brexit protestors march along Piccadilly on in London. More than one hundred thousand people march from Park Lane to Parliament Square in what is said to be the largest public protest against Brexit so far. 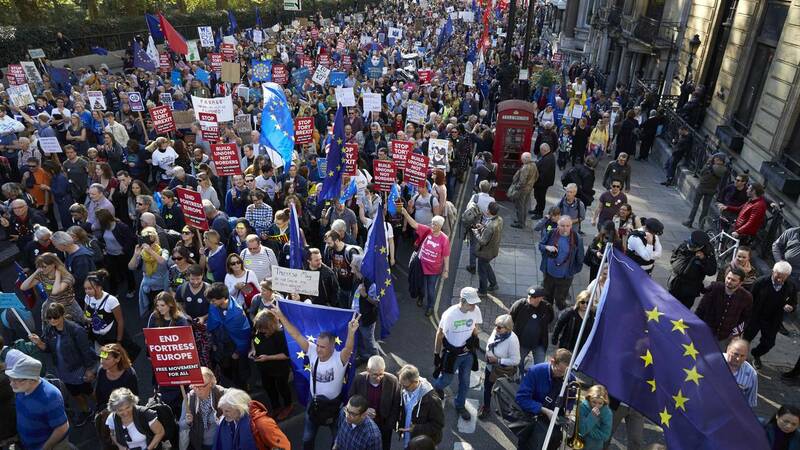 (CNN) - Huge crowds marched through central London on Saturday demanding a referendum on the terms of the United Kingdom's exit from the European Union next year. Organizers of the event, dubbed the People's Vote March for the Future, estimated that more than half a million people were taking part. CNN could not independently verify the number of marchers. A spokesperson for People's Vote said the crowd stretched three-quarters of a mile through the streets and represented the biggest march in London since the 2003 protest against the war in Iraq. Some chanted "People's vote! People's vote!" as they marched, while others shouted "Hey hey Theresa May -- immigrants are here to stay" and "Exit Brexit." Organizers handed out postcards for people to write to their local lawmakers demanding a final say on the Brexit deal, which remains under negotiation between the UK government, led by Prime Minister Theresa May, and the European Union. The march was led by young voters, some of whom were not eligible to vote in the referendum as they were under 18. It was followed by a rally in Trafalgar Square where the speakers included London Mayor Sadiq Khan, a prominent anti-Brexit voice, or "Remainer," and member of the opposition Labour Party. "This is an historic moment, when people from all corners of our country, from all walks of life, come together to have their voices heard," he told the cheering crowds in Trafalgar Square. "This government is leading us towards either a bad Brexit deal or, even worse, no deal at all. These options are a million miles away from what was promised. The government doesn't have a mandate to gamble with our future." Khan earlier tweeted a picture of himself on the march, saying he was supporting it because "a bad Brexit could have a huge impact on Londoners." The British public voted to leave the European Union by a margin of nearly 52% to just over 48% in the June 2016 referendum. Opponents of a public vote on the final Brexit deal say the proposal is undemocratic because the British people have already had their say. Both May -- who campaigned for the UK to remain in the EU -- and Labour Party leader Jeremy Corbyn have said the original result should be respected and fear punishment at the ballot box by so-called Leave voters if they don't. Whatever agreement is reached by the UK government will be subject to approval by Parliament, where May's Conservative Party remains deeply divided over Brexit and relies on Northern Ireland's Democratic Unionist Party for a majority. The deal will also have to be ratified by the parliaments of the remaining 27 EU nations. The EU said Thursday that it was ready to extend the length of the transition period that is designed to smooth the UK's exit from the 28-nation bloc next year. But with the two sides failing to come to an agreement on how the new relationship will work, May has proposed extending this arrangement "for a few months." The thorniest issue of all is the question of Northern Ireland, which is part of the UK but shares a border with the Irish Republic that is currently open to goods and people. Neither the UK nor Ireland want to change that situation but the EU is insisting that once the UK leaves, some form of border controls should be established. With time running out, the fear is the UK could crash out of the EU with no deal on vitally important issues like tariffs and trade.